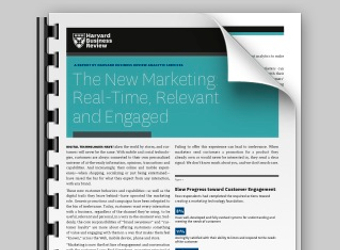 * Sponsored content: This article was created by Marketing in collaboration with SAP, which is providing the paper ‘The New Marketing: Real-Time, Relevant and Engaged’ as a free download for readers. A report by the Harvard Business Review‘s Analytic Services has identified five key areas of challenge that organisations must address in order to implement a marketing transformation project. Data management tasks include data integration, cleansing, standardising, rationalising and modeling. And new data types are appearing almost daily, only adding to the complexity. Craig Macdonald, managing director for Accenture Interactive, says companies need to scrutinise their customers’ digital footprints: the content they consume, email newsletters they click on, forms they fill out, web searches they conduct, pages they visit, calls they make, events they attend and personal connections they make. In order to facilitate all these activities, infrastructure that allows speed and scale is key. Long load times and latency are an increasingly unacceptable part of a digital customer experience, and hurt engagement. The Harvard Business Review Analytics Services authors point out that in many cases the foundation must scale globally and be able to handle enormous sets of data. With global data management and technology infrastructure, compliance with regulatory requirements concerning privacy and security, in each market of operation, is a major headache for organisations. Proliferation of channels means processes are more complex for measuring the performance of marketing activities. At the level of complexity touched on above, it’s clear why CMOs and most CIOs believe they need to work together to enable the foundation for the future of marketing, writes the report’s authors. “It’s essential for the two functions to collaborate on strategic marketing technology investments, such as data analytics, integrated marketing platforms and multi-channel delivery systems,” the authors write. This article outlines findings of a paper by Harvard Business Review Analytic Services, sponsored by SAP. The report covers best practices for building the new marketing foundation, the challenges for organisations undertaking marketing transformation projects, and the role of marketers in delivering an engaging customer experience.